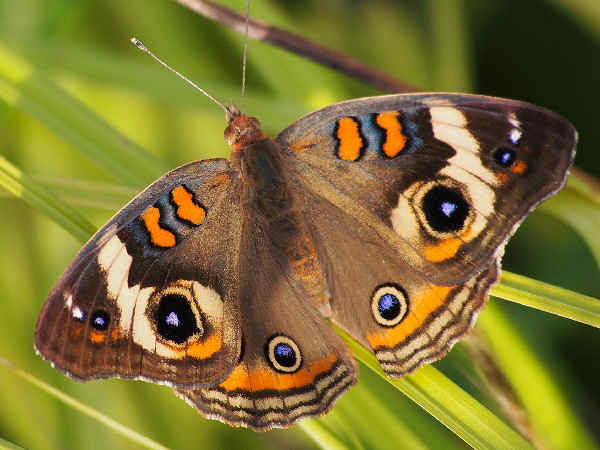 Ohio is one of only a few states that does not have an official state butterfly. Maybe it’s the case that residents like all one hundred and fifty some state species. Temporarily putting the skipper butterflies into brackets, about one hundred species are listed below. The top picture shows a Common Buckeye, in honor of the Buckeye state. The name suits the state. The butterfly is found in most Ohio counties. This page provides a brief review of the Ohio butterflies. Additional butterfly pictures and information can be found by pressing the green butterflies button. Ohio butterflies with white and yellow wings belong to the family Pieridae. With the exception of some western states, most states, like Ohio have a few more of the yellow butterflies. Of the five Ohio white butterflies the Western White and the Cabbage White are the most widespread species. 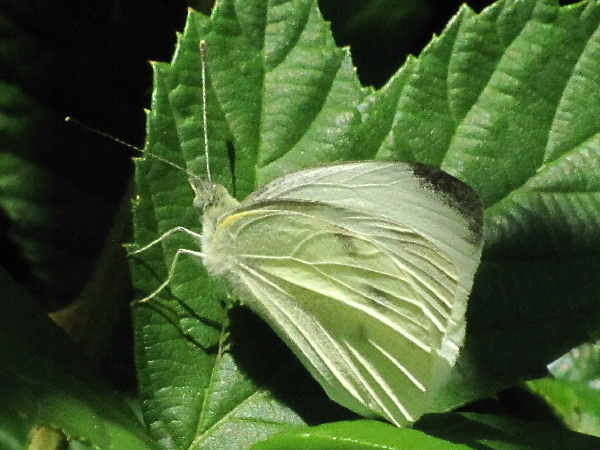 The picture shows the ubiquitous Cabbage White butterfly, found in residential areas and gardens across the United States. Cloudless Sulphur and Orange Sulphur and Little Sulphur butterflies are fairly common throughout the state. Mostof the remaining species are scattered in the state, athough there is a strong southern presence. 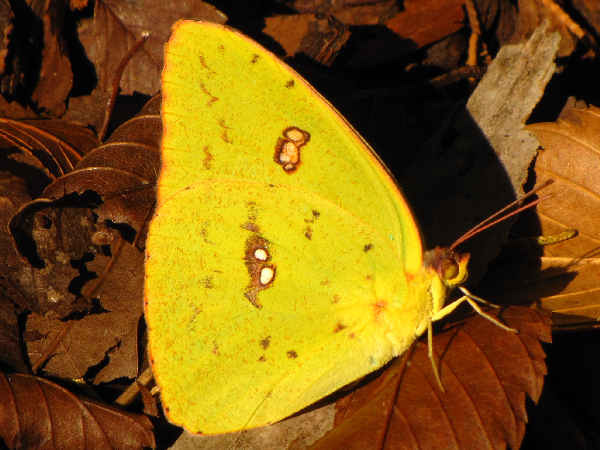 The picture shows a Cloudless Sulphur, one of the Southern species. Ohio has a fairly balanced number of gossamer wing butterflies. 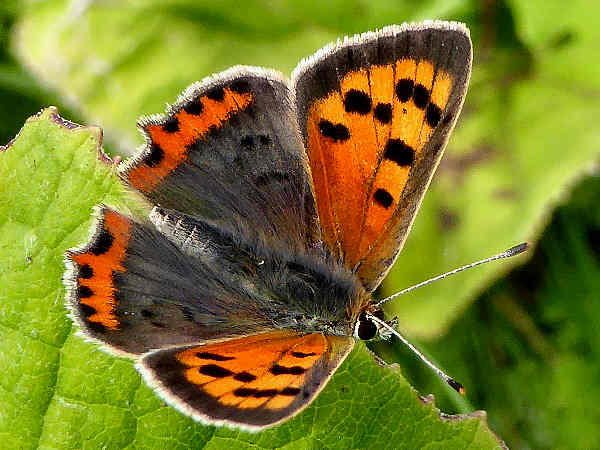 The American Copper butterfly, pictured, is the most widely distributed of the Copper species. A few pockets of Bronze and Purplish Coppers exist in the west part of the state. When it comes to hairstreak butterflies, the list shows a group of elfins, the small brown butterflies often associated with woods. All of the species have a solid presence in most areas of the state. Because of their color, novice butterfly watchers might initially mistake them for skipper butterflies. 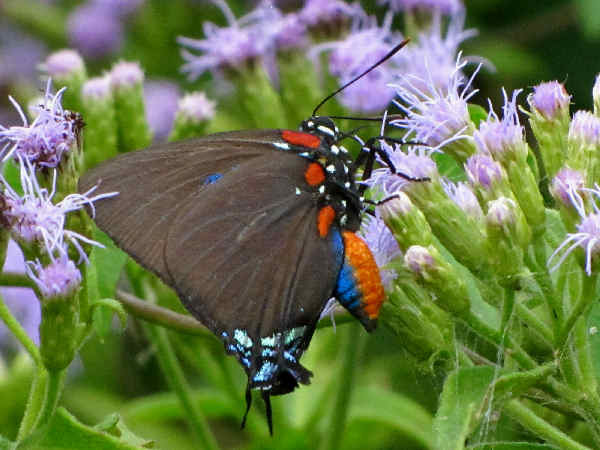 The picture shows a Great Purple Hairstreak, a very common Ohio butterfly. The larvae feed on mistletoe, so getting them in the garden is as easy as planting some. Of course it does double duty for the holiday season. Edward’s Hairsreaks, Banded Hairstreaks and White M Hairstreaks are also common in most of the state. The remainder of hairstreak butterflies are regionally based. As with most states in the east, Eastern Tailed-blues and Azures are the most common of the blue butterflies. The larval host plants for both species explains their populations. 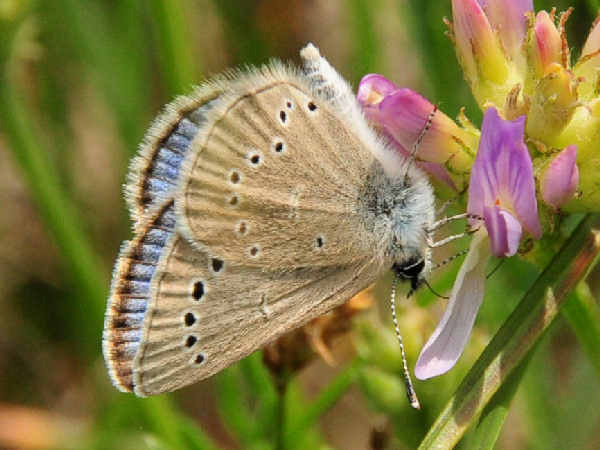 Eastern-tailed blues feed on plants in the pea family, including clover. So they can be found in any yard in the state that allows clover on the edges of the lawn. Azure caterpillars have an even more flexible diet and can consume leaves from a variety of common plants like violets. The picture shows a Silvery Blue butterfly. It’s found in counties along the southern border. With the presence of Monarchs, Queens, Viceroys and Emperors, one might be excused for thinking of Ohio Brush footed butterflies as royalty. Close, they are nice, and they are for all the people of Ohio as well as Ohio visitors. 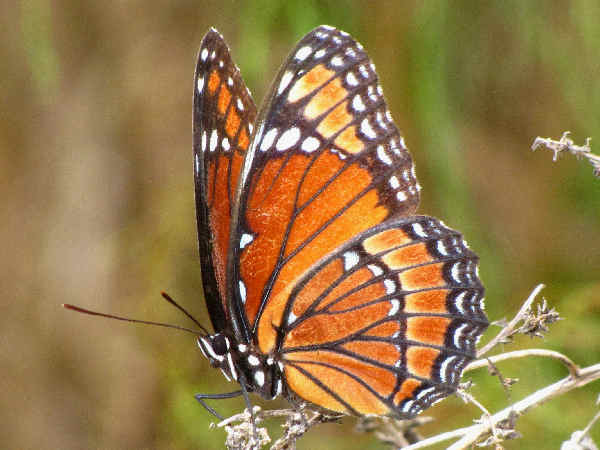 The picture shows a side view of a Viceroy butterfly. They look similar to the milkweed butterflies, the Monarchs and Queens. Many of the remaining species such as Fritillaries and Commas have a state wide presence. They are often the butterflies that are targeted by residents building Ohio butterfly gardens. Fritillaries are drawn to violets. Of course Milkweed is the larval plant for the Monarch butterfly. Most people might not be aware that one elm tree in the yard could attract Mourning Cloaks and the Commas. Comparatively speaking, Ohio’s six swallowtail species is on the low end of the diversity scale. While low in number they are high in density. 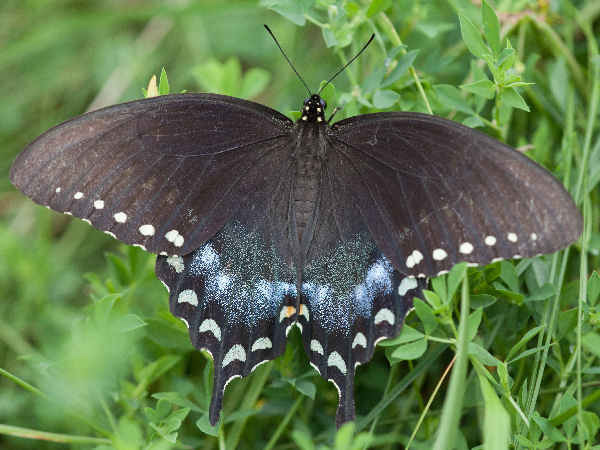 Almost all Ohio residents can enjoy all the swallowtail butterflies during the season. The picture shows a Spicebush Swallowtail butterfly. Residents and visitors will often see these larger than average butterflies. They tend to fly around residential areas and gardens, including hotel gardens where the tourists stay. Inviting them to a butterfly garden is as easy as planting spicebush, the larval host plant. The presence of Zebra Swallowtails indicates the presence of Pawpaw trees across the state. They are the sole larval host plant for the species. Metalmark diversity is pretty similar across the east. Most states have only one or two of these predominantly desert and tropical species. 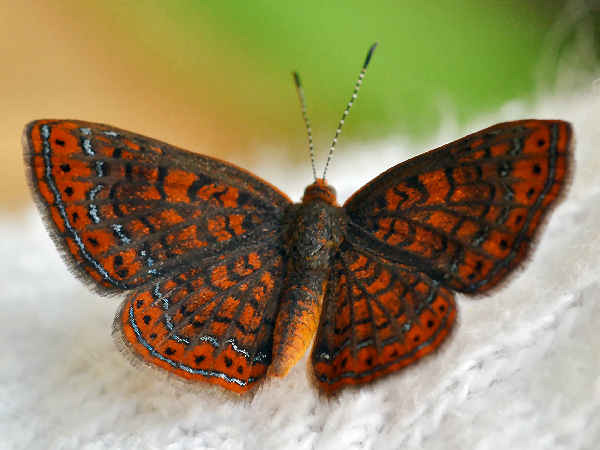 The picture shows a Swamp Metalmark.